IPL MAHASANGRAM at XU Fashion Bar and Kitchen promises to bring you the best of all things combined-DANCE,BOOZE and CRICKET!!! Crazy offers on food and alcohol to make your mouth water and your beer belly crave for more! 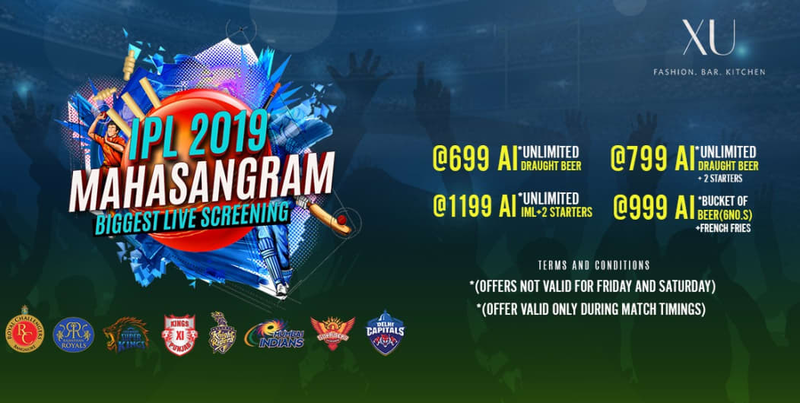 And of course the BIGGEST LIVE SCREENING of the IPL Season EVER! Come join us at XU Fashion Bar & Kitchen for this IPL Season and witness the the battle between 8 teams for the ultimate glory... IN STYLE!!! Offer can be availed on the spot/no online payments. One offer valid for one person. Special Details: Event starts at 8:00 PM. Entry Charge + Cover charge + Offer charge has to be paid at venue. Venue rules apply.